Michael gave a wonderful talk as usual to a very appreciative audience which included the Abbeyside Boys Scouts Troop. The boys were very interested in what he had to say, and when Michael opened the floor to a question and answer session, they showed great enthuasiasm and knowledge on the subject. Michael's previous books, provided by Easons, were on sale on the night. Easons also sponsored a voucher for a raffle, congratulations to the lucky winner. Michael is currently researching a biography of Ernest Skackleton. Our next talk will be given by County Archivist, Joanne Rothwell and has the intriguing title "Love, Lies and Lithographs" on Wednesday 20th March in the Town Hall at 8pm. We recently had a visit by a large group of students from Scoil Chonglais, Baltinglass, Co Wicklow. 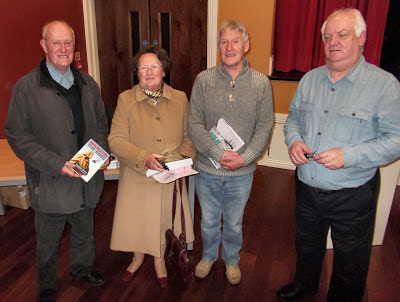 The reason for their visit was to use the App to explore the history of Dungarvan. The audio trail allows the listener to explore the 1000 year history of the town, it features an interactive map, GPS and 38 photos.